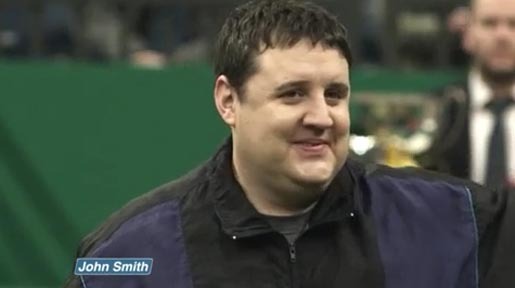 John Smith’s the British brewer has released a new set of TV adverts featuring comedian Peter Kay, renewing the “No Nonsense” campaign first begun in 2002. Kay appears in three new ads, “Dog Show”, “Diner” and “Antique Show”. The most recent, said to be Peter Kay’s last appearance for the brewer, shows the comedian and his dog Tonto competing in the Crufts dog show, with commentary by veteran Crufts Dog Show presenter Peter Purves. The No Nonsense campaign was developed at TBWA\ London by executive creative director Mark Hunter, deputy executive creative director Al Young, copywriter Martin McAllister, art director Theo Bayani, agency producer Jason Ayers. Filming was shot by director Daniel Kleinman via Rattling Stick. Post production was done at Absolute Post by lead Flame artist David Smith. Media planning and buying for the ad is through Starcom. The 2002 campaign won a wide range of awards including silver at the 2003 D&AD Awards, Gold Lion at Cannes 2003, Gold at BTAA 2003, Platinum and Gold at the Advertising Creative Circle Awards. See Burglars, Babies and Mum. The 2002 campaign was developed at TBWA\London by creative director Trevor Beattie, creative director/art director/copywriter Paul Silburn, agency producer Diane Croll, account managers Matt Shepherd-Smith, Vicky Jacobs, Ben Cyzer. Filming was shot by director Daniel Kleinman via Spectre with producer Johnnie Frankel, set designer John Robin Ebden, director of photography Denis Crossan, editor Stephen Gandolfi, sound designer Warren Hamilton.